The next meeting will be held at Eurotel, at Les Diablerets, a small typical village in Switzerland. Use our Google Map page to orient yourself in the area. Download the global access overview as a .pdf document by clicking on the image below. 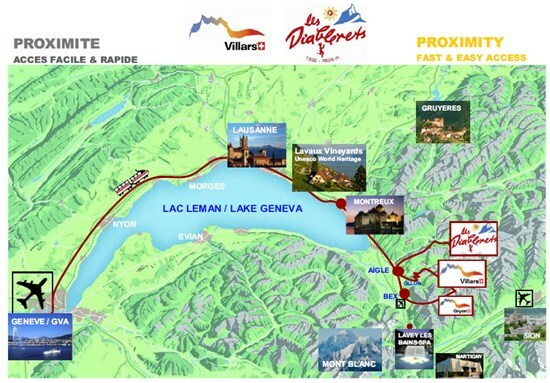 The motorways from Holland, Germany, France and Italy join the major Swiss transport axes, which lead you along Lake Geneva to Les Diablerets. Get the driving directions on our Google map page. 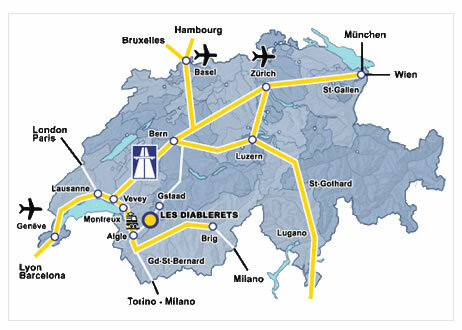 The large international railway lines (via Basel, Zurich, Bern or Lausanne) join through the Simplon line the Aigle railway station; from there a private mountain railway leads to Les Diablerets. It is easy to plan your complete train trip by using the Swiss online timetable 24 hours 7 days a week. If you enter Les Diablerets in the 'To' field, you will get the connection information and you can also buy the tickets online. At the Aigle station, change train and take the line ASD ("Aigle-Sépey-Diablerets") platform n°13/14 ; terminus is "Les Diablerets". This train from Aigle to Les Diablerets is not working (due to work on the line) and it is replaced by a bus with the same timetable as the train. In Les Diablerets a free shuttle will take you to the hotel. TGV Lyria Paris - Lausanne - Aigle. It's possible that the TGV stops to "Aigle", please check the timetable. From the large international centres to Geneva-Cointrin Airport, more than 120 km of motorway or excellent railway lines lead you to Les Diablerets. The train to Aigle (the connection to Les Diablerets) leaves directly under the airport. Click on the tab By railway to get more information about the train trip.